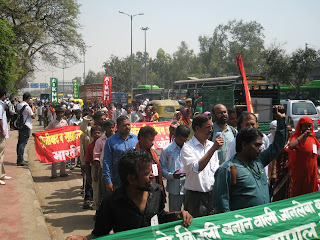 New Delhi, 23 March, 2011: On the 23rd of March 2011 waste pickers marched from Delhi's Kudeshiya Park (near ISBT) to Lt. Governor Office to demand the immediate stoppage of the waste-to-energy plants in Delhi at Okhla- Timarpur (16 MW) and Gazipur (10 MW). Notably, a US Environmental Protection Agency (USEPA) report available on its website observes that the energy generated from municipal waste is costlier than nuclear energy. The rally was planned today to celebrate the martyardom of Shahid Bhagat Singh, the tallest revolutionary freedom fighter of the country. 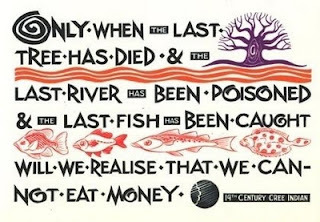 Environmental and labour groups have been protesting against these plants since March 2005 and have been joined in by the affected local residents. The plants which got environmental clearance during the tenure of A Raja as Environment Minister are highly suspect and deserve to be reviewed and cancelled. The proposed polluting technology to deal with the waste from South Delhi, North West Delhi and East Delhi is fraught with disastrous public health consequences for which two companies namely, Timarpur-Okhla Waste Management Company (TOWMCL) and the Unique Waste Processing Company (subsidiary of IL&FS Infrastructure Development Corporation Limited) have been set up. 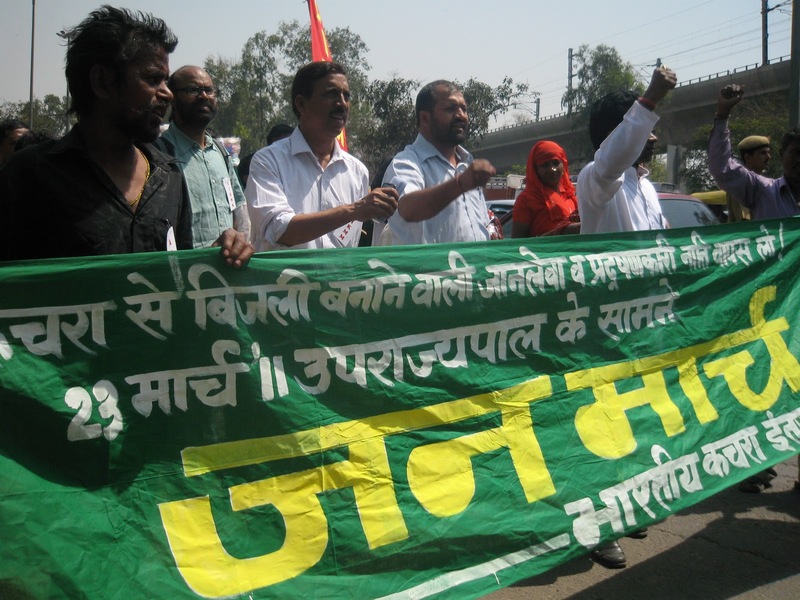 The Timarpur-Okhla carbon credit project was registered on 10th November, 2007 with a claim to reduce greenhouse gases to the tune of 262,791 metric tonnes CO2 equivalent per annum. Unique Waste Processing Company, a subsidiary of Infrastructure Leasing and Financial Services (IL&FS) and Andhra Pradesh Technology Development Centre (APTDC) has incorporated Timarpur-Okhla Waste Management Company for developing the project for processing municipal waste and also to produce electricity at two locations namely Timarpur and Okhla, at the site at Okhla that is adjacent to defunct Okhla Sewage Treatment Plant (STP). TOWMCL is working with New Delhi Municipal Council (NDMC) and MCD. The Timarpur and Okhla plant will together be processing 650 tonnes per day of MSW at Timarpur site and 1300 tonnes per day of MSW at Okhla and claims to generate 16 MW of electricity. The Gazipur plant will process 1300 tonnes per day of MSW and claims to generate 10 MW of electricity. The Supreme Court’s ruling is supported by the White Paper produced by the Ministry of Environment and Forests, stating, “The government claims that this plant will generate electricity, but it will only generate dioxins and other toxic emissions.” Comtroller Auditor General of India (CAG) and Delhi High Court have rebuked the concerned ministries for treating Delhi citizens as guinea pig for experimental technologies that have been tried and have failed. Central and State Government should stop with immediate effect the proposed waste to energy plants in Timarpur, Sukhdev Vihar (Okhla) and Gazipur and high cost routes for waste management must be avoided, instead only appropriate methods such as small-scale bio-methanation, composting and proper recycling be propagated. Central and State Government should give legal recognition to wastepickers and their role in the collection, segregation and recycling of waste. About 3.5 lakhs of urban poor, mostly migrated from rural areas in search of livelihood, are involved in the waste management informal sector. Wastepickers should be given legal entitlement for the access to and management of waste. 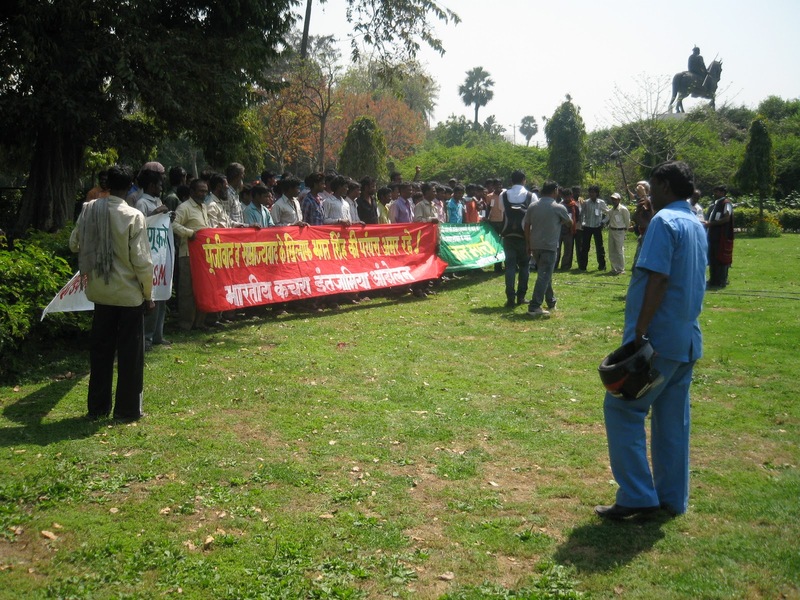 Central and State Government must take cognizance of the threat to waste pickers’ livelihood. Therefore, municipal waste should not be handed over to private companies. Privatization of the municipal solid waste management should be halted immediately. Central and State Government should adopt policies which explicitly aim to reduce resource consumption and associated waste generation. Delhi generates approximately 10.000 Tonnes of waste per day, of which 50% is organic, 30% is recyclable and 20% inert. Both organic waste can be composted and recyclable materials can be managed by wastepickers. Therefore only the inert fraction should be diverted in the sanitation landfills in order to face Delhi’s problem of landfill locations. Central and State Government should commit to maximizing recycling, minimizing landfilling, and eliminating incineration altogether. Recycling (including composting and other appropriate systems for managing organics) is strongly preferable to waste disposal on virtually every criterion: greenhouse gas emissions, the release of toxins, employment, social inclusion, sustainability, and public expenditure. Central and State Government should recognize the informal recycling sector’s contribution to climate change mitigation; and, when undertaking initiatives in the waste sector, should adopt inclusive and comprehensive planning processes that give wastepickers a voice and vote at every stage of project and policy design. Central and State Government should build upon the strengths of existing wastepicker networks with investments and technical support to increase recycling while ensuring decent livelihoods for all workers and traders in the recycling economy. A delgation of wastepickers went to meet the Lt Governor who had deputed Ms Padmini Singhla, Additional Secretary to LG for recieving the petition from the waste pickers. She heard the gnawing concerns of a Dioxins emitting technology and informed the delegation comprising of TOXICSWATCH ALLIANCE, All India Kabadi Mazdoor Mahasangh and other partcipating organisations that Mr Sanjiv Mittal, OSD to LG will look into the matter and apprise the LG. It has reliably been learnt that Prime Minister has asked the LG to look into the matter and Union Environment Minister has asked Delhi Chief Minister to attend to the concerns of the residents against the toxic plants.